Betfair Trading can be quite an overbearing subject to get your head around. When starting out it is often a case of putting together information from lots of different sources. Alongside trial and error. Professional Betfair Trader Caan Berry has just put together a new book. This book is aimed at people that are just starting out in their sports trading journey. 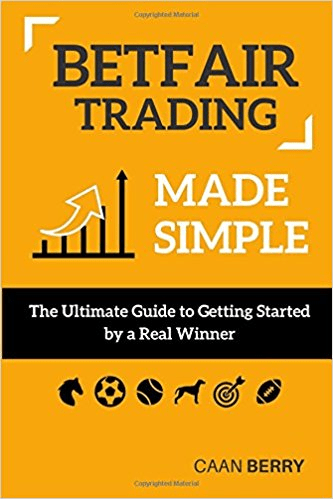 Betfair trading made simple is an entry level book designed to assist anybody that is interested in learning to trade on Betfair’s Exchange, regardless of ability or sport. Promoted by Betfair themselves, Caan explains all that you will need to consider as an aspiring exchange trader. Primarily, Betfair trading made simple is not a strategy based book. However, there are a collection of strong hints and tips as to where the reader should be looking if they are to succeed. Also, several strategic approaches are broken down and explained. Prerequisites: for beginners, doesn’t require prior trading knowledge. These was the initial problem that we set out to solve within this book. Starting from nothing, we wanted to offer readers a quick, efficient and reliable starting resource that they can return to time and again. Making the process of learning to trade Betfair simple and convenient. For an entry level trader this book is worth far more than the listed cost. Providing a logical points and examples on route, Betfair trading made simple is the ideal solution in one neatly packaged book.